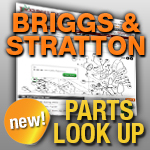 Get a replacement Briggs and Stratton Air Filter here at Jack’s! It may be time to get a new Briggs Air Filter if your Briggs Small Engine has poor performance or is flooding. We offer a large range of Briggs and Stratton Air Filters to fit most Briggs applications. Width At Narrow End 2 3/16"
Width At Wide End 2 7/8"